Durga, the ten-armed Goddess, appears in a brilliantly beautiful form that provides an enchanting feast to every eye. It is a special form that is both frightening and compassionate at the same time and conveys thoughtful spiritual teachings in a wonderful way. 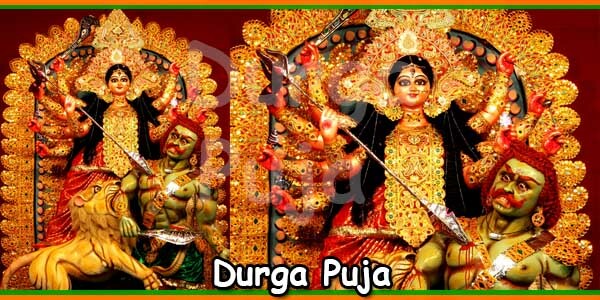 For Hindus, the nine-day period of Durga Puja, beginning from the new moon day to the ninth day of Ashvina, is the most auspicious time and hence for them it is the most celebrated period of the year. 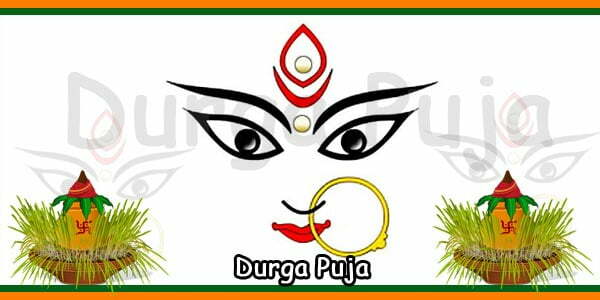 During these nine days they worship Durga in nine different forms which are considered to be the most popular forms of the goddess. Durga Shailputri, daughter of Himalaya, is the first among the nine Durgas. 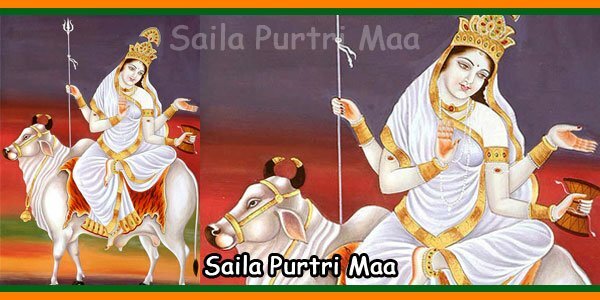 She was Daksha’s daughter in her previous birth, when she was known as Sati-Bhavani and was the spouse of Lord Shiva. Once Daksha organized a great sacrifice (Yagna), and invited everyone except Shiva. Sati, against the desire of Shiva reached the place of Yagna. Subsequently Daksha insulted Shiva and unable to tolerate the insult Sati sacrificed herself in the fire of Yagna. In her next birth she was born as the daughter of Himalaya. Parvati – Hemvati was her name and she got married with Shiva. According to Upanishad, she abolished Indra’s selfishness. All gods bowed before her and prayed for her blessing and for blessing them with Shakti from her. 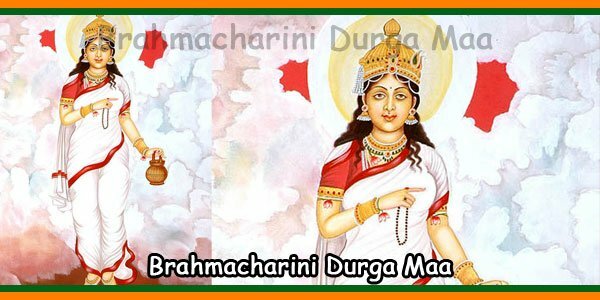 Brahmacharini is the second Durga. “Brahma” means “Tapa” or penance, hence it literally means “one who observes penance”. The beautiful idol of this Goddess, which is full of cheerfulness, holds a rosary in her right hand and a Kamandal in her left hand. She was Parvati Hemavati, the daughter of Himalaya, in her previous birth. One day, while she was playing with her friends, Naradaji came there and predicted her future. He said that she would get married with a person who was her spouse in her previous birth as Daksha’s daughter Sati. However, Narada added that she must observe penance for that. Subsequently Parvati told her mother Menaka that she would not marry anybody except Shambhu, or else she would remain unmarried. And she started her penance. Hence she got her name Brahmacharini. 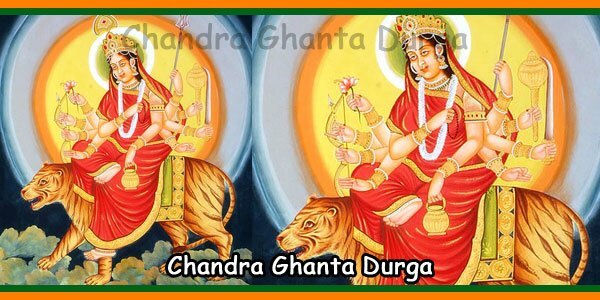 Chandraghanta is the name of third Durga Shakti. She is very beautiful and in golden colour. She has three eyes and a semi-circular moon on her forehead. Her ten hands hold different weapons and devices. With an unmatched image of courage she is seated on a Lion and is ready for a fight. The horrifying sound of her bell frightens all demons and devils. 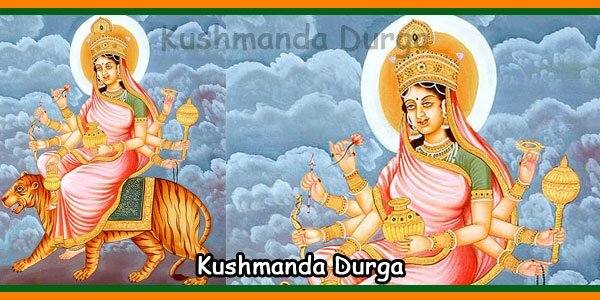 The fourth Durga is Kushmanda. Just by laughing the goddess creates the Universe, symbolically called as egg. Solar system is her home and she shines brightly like sun spreading the rays in all ten directions. She has eight hands and she holds seven types of weapons and a Rosary. She is seated on a Lion and she enjoys the offerings of “Kumhde.” Hence she got the famous name “Kushmanda”. “Skanda Mata” is the name of the fifth Durga. Himalaya’s daughter observed penance and got married with Shiva. They had a son named Skanda, who was a leader of the army of Gods. Durga Skanda Mata is a goddess of fire and Skanda is seated on her lap. Seated herself on a lotus, Skanta is white in colour and has three eyes and four hands. Katyayani is the name of the Sixth Durga. “Katya” was the son of “Kat” and Sage Katyayan was a descendant of this “Katya” ancestry. Katyayan observed penance with a desire to get Paramba as his daughter. Subsequently Paramba took birth as Katyayan’s daughter. Hence her name became “Katyayani”. Kathyayani is seated on Lion and has three eyes and eight hands, holding a variety of weapons in her seven hands. Name of the Eighth Durga is “Maha Gauri.” This goddess is of eight years old and she is pretty white like Jasmine and moon. She wears clean white clothes and ornaments. She has three eyes and four hands. She rides a bull. Her left hand is in fearless posture and the lower left hand holds a Trishul. The right hand holds a tambourine and the lower right hand is in blessing posture. She exists in a peaceful position. It is believed that when her body became dirty due to dust, while observing penance, Shiva used to clean with Ganga water and subsequently her body would shine like lightning. Hence she is known by the name “Maha Gauri”. Siddhidatri is the name of the Ninth Durga. As per scriptures, there are eight Siddhis, which can be obtained by worshiping Maha Sakthi. 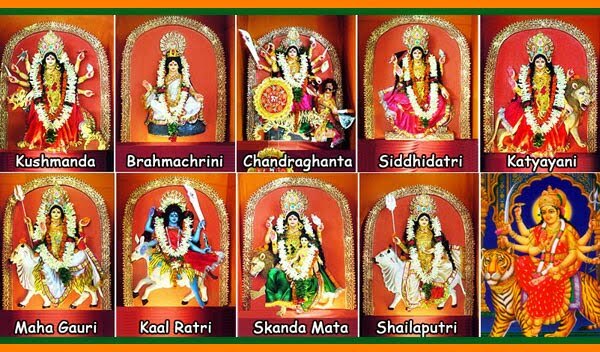 These siddhis are- Anima, Mahima, Garima, Laghima, Prapti, Prakamya, Iishitva and Vashitva. As per “Devi puran”, Shiva possessed all these Siddhis by worshipping Maha Shakti. With her blessings, half of Shiva’s body became that of Goddess and hence he was famous by the name “Ardhanarishvar”. Goddess Siddhidatri is seated on a lion and has a pleasing look. She has four hands. All Gods, Sages, Siddhas, Yogis and devotees worship this form of Durga to attain spiritual qualities.